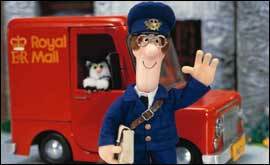 Did you know Postman Pat has a son named Julian? Nope? Neither did I until Claire mentioned it last night after talking to her uncle Stephen. Postman Pat was never married when I watched it and only lived with Jess, his cat. So is he married now? If so, to whom and when did this happen? Who's Julian's mum, or is Pat like Arnold Schwarzenegger in Junior? On an related topic - what does Postman Pat feed Jess? Jess has got to be the oldest cat in history.